Capital is a Capex Planning Solution that allows you to plan new or make modifications to existing capital assets and their related expense including depreciation, maintenance and insurance. Gain valuable insight into the impact of capex decisions on financial results and immediately understand the impact of capital expenses on the financial statement and cash flow. Easily managing all capex planning with a simple end-user workflows. The Capital Capex Planning Solution allows you to eliminate manual off-line spread sheets with inconsistent processes and controls. Take an Oracle Planning and Budgeting Cloud Service and use the pre-built functionality and best practices of this Capital Asset Management template: you are up and running in days. Use your laptop or mobile device to add, change, review, transfer and approve assets. See highly customized reports with accurate information to scrutinize investments and costs, consolidate these into company level, and adhere to organizational as well as legal depreciation rules. Use a web interface and stored calculation procedures. The underlying database supports in-depth analysis of the data. 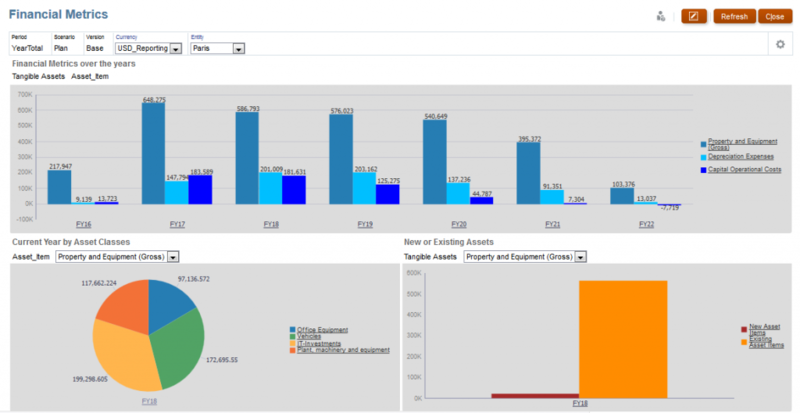 The Capital Management Application has several out-of-the-box reports, which are available to provide an overview per asset category, time period and KPIs. Managers stay on top of their often huge investments, related costs and cash flow. No need to acquire servers and get all those technical problems. This application is built in the Oracle Planning and Budgeting Cloud which is ready to use and maintained by Oracle. Although this application provides the most commonly used capital asset planning functionality, some requirements might vary from those included. You can easily modify the application to meet your specific business needs and processes. Capital Asset Management allows organizations to easily plan for the addition of new tangible and intangible capital assets. They can also modify existing capital assets with impairments/ retirements, improvements, as well as asset transfer between cost centers. Centralized definition of assumptions or local freedom of planning? Plans can easily be distributed to decision makers at the operational level. Rules are in place to ensure correct calculations and data validation. Choice of data entry method: Use the Excel Add-in or the web browser for your data entry. Integrated: Improve your plan accuracy, predictability, and accountability and immediately assess the impact of capital asset decisions on the overall expenses and financial statements. Currency conversion: The automatic currency conversion enables you to work in your local currency and report in other currencies. Prioritize and approve new assets: Use a submission and approval process for acquiring new assets or changing existing assets within this application. Improve resource planning: Compare scenarios like early or delayed investment on expenses and cash-flow. Optimization of acquisition and amortization of resources is at your fingertips.